The Laves phase strengthened ferritic steel Crofer 22 H has recently been proposed as construction material for interconnects in solid oxide fuel cells (SOFCs). In the present study, the oxidation kinetics of Crofer 22 H at 800 °C was compared with that of a Mn-free batch during exposure in air and Ar–H2–H2O, the latter simulating the anode gas of a SOFC. Main emphasis was put on studying the oxidation mechanisms of Crofer 22 H during the early stages of isothermal reaction as well as during long-term discontinuous exposure. 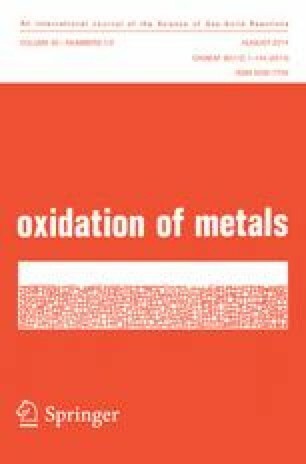 Differences in oxidation mechanisms in air and simulated anode gas (SAG) were defined. Oxidation rates for Crofer 22 H in air were found to be initially slower than in SAG, but the opposite effect was observed after longer exposure times. This effect of atmosphere composition on the oxidation rate is shown to be governed by the time dependent extent to which the inner chromia scale layer is covered by an outer Cr/Mn spinel layer. In both test gases the minor addition of silicon to Crofer 22 H resulted in internal silica formation during the very early stages of oxidation; this effect vanished after longer exposure times. Incorporation of titanium in the scale differed for the two test atmospheres because the oxygen partial pressure affects titanium solubility in chromia and especially the spinel phase.